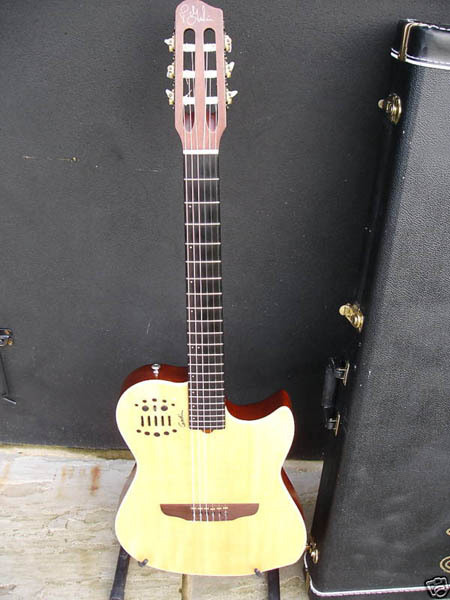 My latest waste of cash is a Godin Multiac nylon guitar I purchased for a good price on eBay. After being impressed with the XTsa guitar, I was eager to try another of their instruments and have always had an ear for nylon instruments, though cannot profess to have any proficiency on such an instrument in the classical context. For me, I play the Multiac the same way I play the electric, with a pick and as a lead instrument in the genre of “rock” or whatever they call it. The guitar itself is a wonderful piece of craftmanship and feels solid and expensive. The electronics means I can connect it to all my GK-enabled Roland gear and get any sound from it. Its MIDI tracking is second-to-none and this is what turns me onto the Godin guitar range. If you want a guitar that can solidly track MIDI data, the RMC piezo pickups in Godin guitars are THE BEST. THE BEST. THE BEST. I said that so it goes in. Roland might have the market with the GK range of MIDI pickups, but the RMC piezos have the best all-round use. Don’t think I’ve been lazy with the lack of music output on this site. The way things are at the moment, my studio isn’t exactly how it was and I’m doing little bits of recording as my bass is packed away. For your consideration is the next piece which is a demo track that I recorded a few weeks back. It showcases the Multiac and will form the basis of a “proper” song once I’ve thrown some bass and electric guitar at it. For now, you just have drums and acoustic guitar. It’s fairly loose and is more of a framework to hang other elements on. It’s how I record, from the bottom-up I think it is described in music circles. At the moment, I’ve got loads of little bits of music on the hard drive recorded like this. Fragments of songs to be, little riffs that have been committed to a stream of zeros and ones, bits that will one day be recombined to form something more solid. A digital musical pot noodle – just add water – or in this case magical musical glue. Anyway, enough of the preamble: this is a demo track using the Multiac and I really like the tone it has.